One of my all time favorite “ghost” stories is about a Raggedy Ann doll named Annabelle. The story begins in 1970; a mother purchased the child size doll at a hobby store as a present for her daughter Donna who was a nursing school student at the time. She lived in a small apartment with her room-mate Angie Donna loved the doll and placed it on her bed but this didn’t seem to be where Annabelle wanted to stay. Over a short period of time the girls noticed Annabelle would be moved slightly. Very small changes in positions at first but still noticeable, especially since neither one of them had touched her. Then the movements became more bizarre. Donna and Angie would come home to find Annabelle in a completely different room than where they left her. No one else had been in the house but there the doll sat on the couch with her legs crossed or sometimes even standing upright, leaning on a chair. If they left Annabelle on the couch and stepped out, they would return to find her back on Donna’s bed with the door closed. Several weeks into the doll’s stay, there seemed to be pieces of parchment paper found around the apartment. Neither Donna nor Angie had any parchment paper in the house and had no idea where it was coming from. To add to the mystery there was what seemed to be a child’s writing scribbled on the paper reading “help us” or “help Lou.” Lou was a close friend to the girls and soon the message would be all too clear. After another one of Annabelle’s “moving” episodes, Donna noticed what appeared to be blood on the dolls hands and chest, now scared and not knowing where to turn they contacted a Medium and a séance was held. 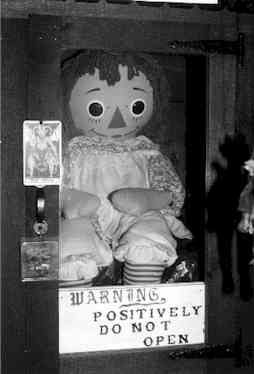 During the séance it was told that a spirit of a young girl named Annabelle Higgins was the one living in the doll. She said that she had died in a field where the apartment now stands and felt safe with Donna and Angie. Annabelle wanted to stay and Donna gave her permission to do just that, a choice they would later come to regret. Now back to Lou. One night while taking a nap in the apartment he began to have what seemed a nightmare though he was sure he was awake, yet he couldn’t move. Looking around the room he had a strange eerie feeling. Lou looked down to see Annabelle gliding up his leg. When she got to his chest she stopped. Soon Lou felt as if he couldn’t breathe, as if he was being strangled, could the doll possibly be choking him? Soon he blacked out, waking up that morning; he insisted this was no nightmare. Annabelle continued to attack Lou, on one occasion leaving claw marks on his chest. Once the doll seemed to have malicious intent, Donna contacted an Episcopal priest, the priest contacted a higher authority in the church and that higher authority contacted paranormal investigators Ed and Lorraine Warren. After listening to everyone’s experiences the Warrens came to the conclusion that the doll was not haunted by the ghost of a little girl but manipulated by an inhuman and demonic entity. The demon tricked Donna and Angie into believing there was the spirit of a scared little girl in the doll so they would give it permission to stay in the home. The demon was using the doll to gain recognition and eventually try to find a human host. The Warrens made the decision to take the doll with them. With Annabelle in the backseat and the entity still attached and very angry it began to attack. The car would swerve with every turn, it would stall and the brakes would fail. The Warrens were able to avoid collision; after Ed stopped the car long enough to throw Holy Water on the doll, the car was back to normal. They arrived home and placed Annabelle in a chair near Ed’s desk. The doll would levitate and within a few weeks began showing up in different rooms. A special case was built for Annabelle in the Warrens Occult Museum in Monroe Connecticut. While in her case she doesn’t seem to move any longer but she is still believed to be something one must respect. Several years ago while on a tour of the museum a young man began to taunt Annabelle. He was tapping on the glass and daring her to do something. Ed asked the man to leave. While riding his motorcycle home, the young man collided into a tree and died. His girlfriend survived the accident and said the last thing she remembers was how they were laughing and joking about the doll.